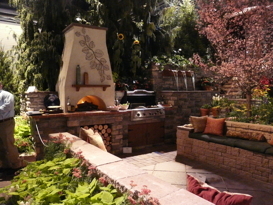 Sunshine Landscapes, together with our professional partners, are your hardscaping experts. 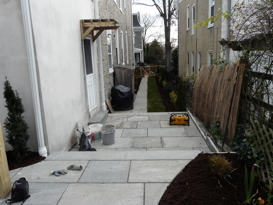 We work with brick, stone, masonry, pavers, wall systems, flagstone and stamped concrete (which can be used to simulate flagstones, brick, granite, and even marble) to enhance every aspect of your outdoor living areas. Whether you're looking for something as simple as a retaining wall or as complex as an entire outdoor patio system with a built-in barbecue and oven, we can design and build it for you. Call us for a consultation, and see how hardscaping can change the way you live in your outdoors. 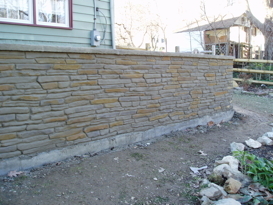 Hardscaping can be used to create a deck or patio, steps, walkways, stone paths, retaining walls, stone walls, boulder walls, complete outdoor kitchens, outdoor California rooms, decorative alcoves, seating areas, pool decking, and more. Call to ask about our creative poolside solutions! 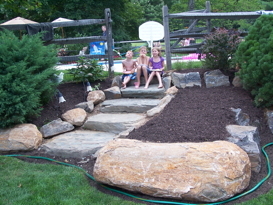 Sunshine Landscapes also installs shed pads and playground pads. Call us for a free estimate! © 2009 Sunshine Landscapes. All Rights Reserved.